To bumper or not to bumper? I have never done the crib bumper for any of my babies and was wondering if they (the bumper not the baby :-) are worth the hassle. They look nice, but I have always leaned away from them because of the so called "smothering factor." I have also heard they get mashed/messed up and do not stay attractive looking. I will indulge you, Dear Readers, with these long awaited photos. (Taken by Seth.) In the top one I was still attempting to look civil after a night of tossing and turning. This new "form" of mine does prevent me from my normal nighttime crashing! Now for all who have been kind and called, asked or emailed as to my condition, I will give a little update. . .
~I am 31 weeks pregnant. ~The nausea has been gone for weeks!!!!!!!!!!!!!!!!!!!!!!!! ~The baby is moving down. A bit obvious in the way my clothes are fitting, and I went from feeling like I was smothering to thinking my pelvic bones are going to shatter any day now. ~The baby is quite active and lets me know that it does not like some of my attempted sleeping positions. 2. At least my legs and feet do not swell. 4. I have a God who smiles on being fruitful and multiplying. 5. I have a wonderful and understanding husband! 6. I have two little boys who are HUGE helps to their mommy! 7. My family has been buying loads of things for me since I got rid of 95% of my baby stuff before my move to SC. 8. I have lots of friends and fellow bloggers who bring me cheer. 9. Thanks to Troy's recent requesting of prayer for me, there are many people praying for me, and I can feel a physical difference. but I am still terrified of delivering babies and the recovery!!!!! 3. I love organizing closets. 4. The thought of a cruise is not appealing to me. 5. 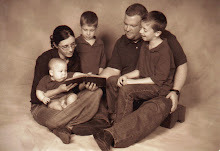 I thrive on homeschooling but would have a nervous breakdown if I had to be a "regular" classroom teacher. 6. I am terrified of childbirth. 7. It is my belief that Brussels sprouts are not meant to be eaten. It finally happened last week. My first Meet In Real Life was with a fellow blogger from IN. It was so fun to actually sit in person and chat with someone that I had only known through their blog and website. I am so glad we had the opportunity! If you do not know her, just hop over to this spot. Blessings on your life, Nicole! 1. Someday I would love to visit Prince Edward Island. 2. I do not like blimps. In fact, they are rather freaky to me. 3. In the future, I would love to own a white baby grand. 4. I wipe the cover of every piece of library material that comes in this house. 5. One of my "dreams" would be to play a huge piano piece accompanied by a symphony orchestra. 6. Etymology fascinates me, and my love for words makes me content to sit and browse the dictionary. 7. The only "relaxation" technique I like is to have my hair combed. 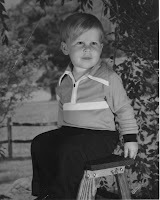 Here is the man himself - twenty-eight years ago when he was only two years old. What a little cutie! You can see how Ethan favors his daddy and not me. Happy birthday, Troy; I love you! Did you really ask that?! Les, I can hardly believe you posed such a question! :-) After all the parties you and I have attended together. . .After all the times you have seen me swipe "real" icing. . .you ask if I used "canned?!" Not a chance! I go for the real stuff! 1. You can tap on the cookbook and see the cookie recipe I used - Soft Batch Choc Chip. 2. As for the delectable icing, it can be found here. 3. 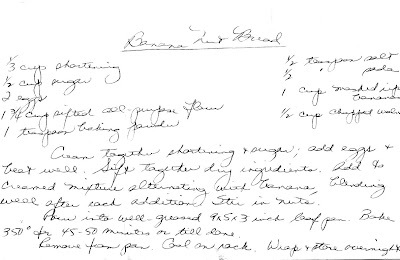 And just for Gail, below you will find my Mother's Banana Bread recipe that I use. Yes, it has been almost a year since our last "crime" which brought law enforcement to our door, so we thought it was time for another dastardly act! This time the boys are "holding up banks." Aren't they the cutest little banks, too?! :-) You need to enlarge the picture and see the details on them. They are divided into three sections labeled church, bank, store. I first saw these in connection with Larry Burkett (I think.). Anyway, I have been trying to locate some ever since that time. You can imagine my excitement to find them for $2 each at a consignment sale! We had a great lesson today about money, and the boys had a blast dropping their stash into each part. Bless their little hearts, they were just as happy to load up the church section. It warmed my heart, and I am sure it did God's, too. And just in case you're wondering, yes, the rooster is gone!! I finally got brave enough to ask the other neighbor, and he confirmed my suspicions. He also let me know they did not eat this one. Ahhhh. Such a peaceful place here again. The Great American Cookie Co.! She also likes John Deere items. I gasped at the price of the baby teether! Oh, well. . .it is her money. Let's just say that the teether cost as much as a pack of diapers! These three outfits were some of my favorites. I just looove little baby clothes. When I showed this to him, he thought it should go on the blog. 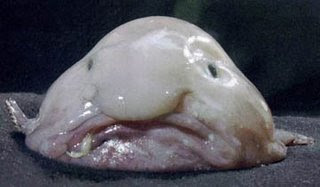 The blobfish (Psychrolutes marcidus) is a fish that inhabits the deep waters off the coast of Australia and Tasmania. Due to the inaccessibility of its habitat, it is rarely seen by humans. 2. I have not heard the rooster in about a week. (Happy dance inserted here. Hee. Hee.) Now, I just have to get the nerve and opportunity to ask the other neighbors (who are good friends of the "fowl people") what brought about the blessed reprieve of noise. that laundry is one of my favorite household duties. I came to this conclusion during my many days of nausea. It also did not take long for me to realize how much I detest dishes - even with a dishwasher handy! Yup. I'd rather do laundry any day. Maybe it is because I have it down to a "science" for this home. Perhaps someday I will share my laundry schedule, but for now. . .I need to head to the laundry room. :-) And, yes, the pretty pink walls do make it a nice place for the job. So, what are your best and worst household chores? I am very curious to know! I met him yesterday when I went to his shop to pick up Troy's resoled shoes. I didn't want to go. I really dislike trying to locate shops in downtown, meanwhile finding a place to park on the street, and getting the boys on the sidewalk with no one getting run over by speeding vehicles. Well, I finally found it - a tiny place crammed in the middle of a string of businesses. As I stepped inside, I felt like I had gone back in time. It reminded me of a place I would have gone with my grandpa. . . It was a simple - non nonsense place, a bit outdated looking to be honest! As I peered over his shoulder and looked in the back room, the equipment looked rather pre-Civil War era. But I like Mack! Want to know why? He is a hard working man that knows his trade and takes pride in it. This little shop had not let the big appetite of corporate America swallow it up. No, sirree. Mack has those strong hands of a man with a trade. He uses little handwritten papers and tags - no laptops sitting around that room! We chatted happily, and he never once asked me my zip code or home telephone number - just told me to come again. I liked Mack's personal smile - those white teeth radiating from his black face. It was such a genuine smile. It did my heart good to have to pick up those shoes! I was once again able to see the heart of America in the little "hole in the wall" place of a Southern tradesman. Thanks for being real, Mack. I hope, for your sake, that a lot of shoes find their way to your counter. Mack brought to mind the vacuum cleaner repair man I met this summer, too. There was a short in the cord, so I took it to some little house that had a small sign in the front. Same scenario. An older man that knew what he was doing. No frills. He kindly asked me a few questions about when the vacuum died and told me he would call when he knew what it needed. The man did just that, and when I returned, he also had a little handwritten receipt. Never once did he try to get me to buy a new vacuum or give me an "upgrade." Nope. He was an honest man doing an honest job. I like that! But to top it off, he carried the vacuum to my van. I thought that was such a sign of respect. I hope lots of people use his shop; he deserves the business. Oh, back to Mack. . .I need to mention something - you know what really impressed me with him? Besides doing a great job of resoling the shoes (which is what Troy asked), Mack polished them. And let me tell you, they gleam!! Mack didn't need to, but he did.